USDA-certified 100% Organic Cotton Cover from Texas. FDA registered # 3008361561. Ideal for skin-sensitive women. No contact with synthetic materials. Are you looking to go organic during your period? Then these organic sanitary pads from Natratouch should be at the top of your list. Read our buying guide packed with information to help you decide if they’re right for you. They are a reasonably priced organic alternative to regular menstrual pads. If you’re really looking to save money though, consider a menstrual cup or reusable cloth pad. They’re 100% USDA certified organic. Great for those with sensitive skin. There won’t cause irritation like regular menstrual pads or tampons. No harmful chemicals. Regular sanitary pads contain lots of harsh chemicals that aren’t good to put next to your skin. These organic pads are a great choice for your body as well as the environment. If you check out organic cotton pads, or tampons at your local health food store you’ll probably notice how expensive they are. That’s the bad news. The good news is that there is a much cheaper option. If you search for “organic pads,” or, “organic tampons” on Amazon, you’ll notice that these products are much more affordable, and up to half of what you’ll see in a health food shop. Traditional pads and tampons contain trace amounts of toxins in them. They come from the pesticides used to grow the cotton as well as the manufacturing process. Although there are only small amounts in these products, exposure to this stuff can add up over time. It only makes sense to go organic, if possible, particularly for a product you’re putting inside your body, or next to your skin. Consider going organic today! A large number of women have already made the switch. If you’re looking specifically for organic pantyliners, then you’ll need to check this out: Top 5 Organic Pantyliners (Natratouch is on the list!). 100% cotton, which feels good next to the skin and biodegrades easily. Is there a Cheaper Way to Get Organic Pads? That’s a great question and we’re happy that you asked. The most common complaint about organic sanitary products is that they’re quite a bit more expensive than regular ones. To us, it’s worth it to avoid toxins on a monthly basis. The good news is that there are places that are cheaper than others to get this stuff. If you shop at your local health food store, pads like these ones from Natratouch are very expensive. That’s why we recommend shopping online somewhere like Amazon.com. You can often find lots of great deals. Read on for where you can buy them. These organic cotton menstrual pads make an excellent choice for those looking for an alternative to traditional pads (also consider these organic reusable menstrual pads). The main difference with these organic pads is that they don’t contain any harsh chemicals which are really bad to have next to your skin. They’re also scent-free so are great for those with sensitive skin. Besides being better for your health, these chemical free sanitary pads are also great for the environment. They don’t have all those chemical waste from the manufacturing process. Plus, they’re plastic free and will decompose in a few years, instead of the thousands of years for regular ones. Go green for your period! It’s time to come to terms with all the plastic waste we’re creating in the world and to take care of our Earth for the future. There are very few negative reviews about these organic pads. These natural pads stay in place easily. Even though they’re ultra-thin, they absorb fluid very well. 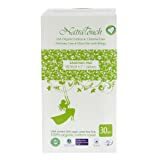 You can easily get the Natratouch Organic Cotton Sanitary Pads on Amazon. What are your thoughts about this chemical free sanitary napkins? Leave a comment below and let us know what you think. Also be sure to share this information on Facebook, Twitter, or Pinterest.